The 1/10 Electric Powered Crawler is equipped with brushed RC540 and a lot of metal parts to make sure the construction solidly.The high precision ESC is also equipped on the Car. You are not only have a chance to see the beautiful nature scene but also climb over the most challenging rugged terrain. 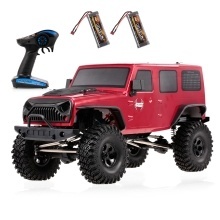 This new Rock Racer equipped with powerful waterproof electronics will give you maximum fun all day long in any terrain. Let you experience different feelings, have more fun!